During the 21 months he spent imprisoned in the secret Khmer Rouge prison code-named S-21, Bou Meng found a strange comfort in his prison uniform: black cotton shorts and sometimes, when he was lucky, a shirt. “It was very cold at night, as I remember,” he told VOA Khmer in a recent interview. No blankets or any other personal items were given to prisoners, who spent most of their days and nights shackled to beds inside tiny rooms. Often they were released only to be tortured. For Bou Meng, one of the few people to have survived the infamous prison, where 14,000 people were confined and ultimately executed, the clothes still bring back vivid memories of those months. 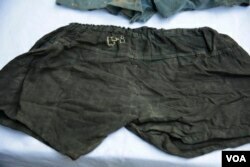 Large piles of pants and shirts similar to the ones that Bou Meng once wore, along with a jumble of hats, children’s clothes, shoes, belts, and other fragments of clothing, were part of the detritus left behind in the prison when the Khmer Rouge fled ahead of a Vietnamese invasion in January 1979. Many of them were grimy and stained with blood. Now this is changing, as the garments’ value as evidence and cultural artifacts is being recognized. Beginning late last month, the Tuol Sleng Genocide Museum, which is administered by Cambodia's Ministry of Culture, began a multi-year project to conserve 3,000 to 5,000 cloth artifacts, funded with a $55,000 grant from the U.S. government. For the first time, the clothes will be sorted, preserved, and, in some cases, displayed as part of the memorial to the 1.7 million Cambodians who died, about 25 percent of the population, during Pol Pot’s Khmer Rouge regime between 1975-1979. Julia Brennan, an American textile conservation expert spearheading the project, said the effort would employ cutting-edge technology to ensure the clothes would be properly preserved without removing the stains that testify to their history. “The dirt, stains, accretions, are a part of the genocide story and bear witness to the atrocities,” she said. Brennan has also helped Rwanda’s National Commission for the Fight against Genocide preserve 45,000 cloth artifacts belonging to genocide victims there. 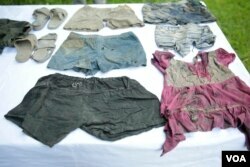 She says clothes belonging to victims of mass crimes are unique, because in addition to their historical value they can be “forensic evidence” that may need to be analyzed in the future. Brennan is working to set up a long-term storage system at Tuol Sleng Genocide Museum using a new technology called DryStore, a see-through rectangular plastic container with two built-in hygrometers that maintain a low relative humidity suitable for textiles. DryStore was developed in 2012 by Rhino, a global technology provider for the agricultural industry based in Thailand, and relies on desiccant beads that absorb moisture while killing mold and insects. Until now, it has mainly been used for seed drying and storage. In repurposing it for clothing conservation, Brennan has dubbed the technology a “heritage box,” and has used the U.S. grant money to purchase about 50 containers for Tuol Sleng. Each can fit around 72 liters of textile artifacts. The first step of the Tuol Sleng project, Brennan says, is to test the heritage box system and develop a protocol that can be followed after she leaves Cambodia. “This storage system is efficient, low cost, and simple to use,” she said. If successful, it could be a breakthrough showing the drying technology “can be applied everywhere for cultural heritage preservation, especially in humid climates,” she added. Every textile scrap and article of clothing in the museum will also be photographed and documented, with a detailed description of its condition and description, before storage in the heritage box. This information will form the basis for a computerized collection database, searchable by scholars, researchers, and survivors. While refining the heritage box system, Brennan is also training a Cambodian cultural heritage conservator from the Tuol Sleng Genocide Museum, a textile conservator from the National Museum of Cambodia, and two archaeology students from the Royal University of Fine Arts about textiles and basic preventative conservation. One of the trainees, Chenda Ko, a conservator at the genocide museum, recently attended a two-week program in cultural heritage conservation in Poland. She said only about 1,000 of Tuol Sleng's cloth artifacts were in reasonably good condition. “The need for immediate preservation is now,” she said. The textiles have been entirely sorted and are sitting in blue and red baskets, waiting to be documented and preserved in the heritage boxes. Chenda Ko said she is concerned about the size of the conservation facility. “It is too small” for so many artifacts, she said. But Bou Meng said the initiative is important to him, in part because it will allow future generations of Cambodians to see exactly what his prison clothing looked like. Although they are long gone from his possession, he still remembers the black shorts that gave him a shred of comfort in the dark.